For the past few years, your local Einstein Bros. Bagels has teamed up with the National Art Honor Society at Farragut High School to host Empty Bowls, a charity event where a simple meal of soup and bread is served in a handmade ceramic bowl that you get to take home with you, and all the proceeds from the tickets sold go to a local food kitchen. The members of the National Art Honor Society Farragut chapter, along with Farragut High art teacher Wendie Love, build and glaze over 100 ceramic bowls for the event, as well as serve at the event itself. Our crew even gets involved in making bowls for the event. 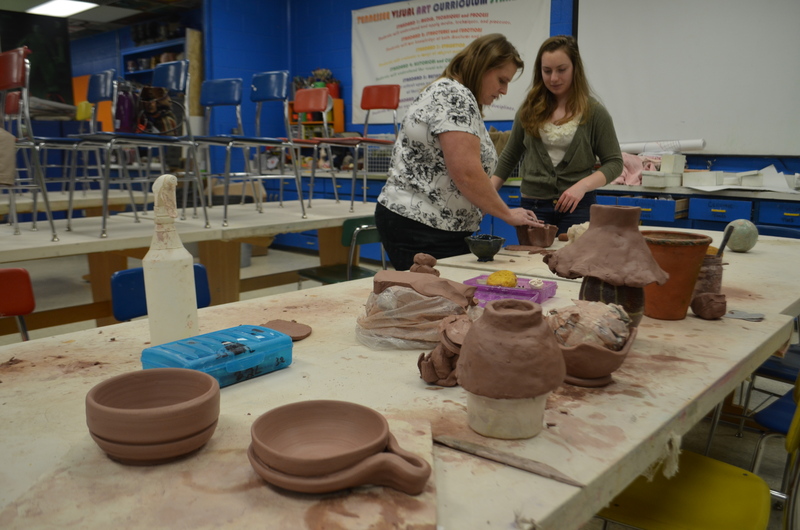 Wendie Love and Madison Martin work on the latest bowl for Empty Bowls. Empty Bowls will be held Thursday, April 17 from 6 -8 PM at our Farragut location. Tickets can be purchased in advance through Wendie Love at the Farragut High School. There will be a limited amount of tickets sold at the door the night of the event, depending on how many bowls remain. We’ll be posting more updates and pictures as we get closer to the event, hope to see you there! Today’s post is all about the specials! Have you sent in your awesome picture to our Photo Fan contest yet? Your first entry gets you a coupon for a Free Drink, and every entry has a chance to win a Drink Party for you and your friends! Just send a picture of you, your family, your friends, your dog, ANYONE enjoying Einstein Bros. to our Facebook page, along with your email address, and get your Free Drink today! Have a great week, and we hope to see you at Einstein Bros. Bagels soon! * Good for one naked bagel per customer with purchase. Cannot be combined with other offers. **Must present the current bulletin to receive discount. Cannot be combined with other offers. ***Excludes bottled beverages.